One of my clients just lost a valued employee from their leadership team. One of the reasons she decided to leave was the pressure she felt from her boss to perform in sales. She had recently accepted a promotion to sales from her marketing position. This year she’d been working on a very large prospect that would very likely have topped the company’s previous best ever customer. She gotten them a commitment just not the full commitment that the company sales procedure outlines. It created conflict and anxiety as she worked to close them to a long term engagement. The offer she received from another company is substantial. Among the perks were a higher compensation, limited travel, and the opportunity to work from home. The latter really appealed to her since she recently had a baby and has a son who is still preschool age. The position also puts her career back into the marketing design area, her original vocation and education. It’s likely she would have accepted this position regardless due to the appeal it offered. Still when asked why she would consider leaving, the pressure of sales, and specifically closing this account contributed to her decision. She hadn’t approached the other company; rather they’d spoke to her at a recent trade show and pursued her. How do you balance the need to perform with the Core Values and Purpose of your business? In our coaching practices with the Rockefeller Habits we frequently remind our customers to balance productivity with relationships. People and Process are the Two Drivers, and it’s important to recognize that when you focus too much on one, things can run amok. When you focus too much on getting sales, do you threaten to lose focus on balance in your people’s lives, demanding they work hard to get more leads, or close more sales? Does pressure to make sales intimidate, constrain, and restrict your people or possibly influence their communication to your prospects? The person leaving recently provided influence and ideas on the formulation of the company’s Core Purpose. She’d been involved in the development of the Company’s Core Values. She appeared to be in total agreement with these “emotional” elements of the business. Yet still she decided to leave. Arguments could be made that perhaps she wasn’t the right person to be in a sales position. Good sales people can usually respond to pressure and produce exceptional results. Not being in their sales meetings I don’t know how pressurized and negative they might have been for her. Based on her ability to produce sales she is a good sales person, however she had been in and out of a sales position before because she didn’t like having her compensation package based so much on performance. It’s difficult to lose a quality person, an A player who fits your core values and purpose. Was she the right person in the wrong seat? That will probably be a question we explore in our weekly meetings. My client is intent to learn from this so he can prevent losing a quality person in the future. The question here is did we focus too much on the Big Hairy Audacious Goal that we failed to balance it with the proper amount of Core Values and Purpose. I’m not sure this individual would even knows that. It may take time and retrospect to determine this. The offer might have been simply too good to refuse regardless if conditions had been ideal with my customers business. Collins notes that this dichotomy that F. Scott Fitzgerald refers to exits in the same person or people. The leadership for 90% of the Good to Great companies came from inside the company. They share the values, yet are also the change agents. What’s the question for you to absorb and take action on? Is your company a good balance of culture (Core Values & Purpose) and productivity (BHAG)? Do you have A players who embrace your culture yet stimulate progress and produce results? Is there an over emphasis on one over the other? Many companies focus on results to the exclusion of culture. The outcome is burnout, pressure, and turnover. How frequently do you evaluate your people? Do you do annual, semi-annual, or quarterly performance evaluations? 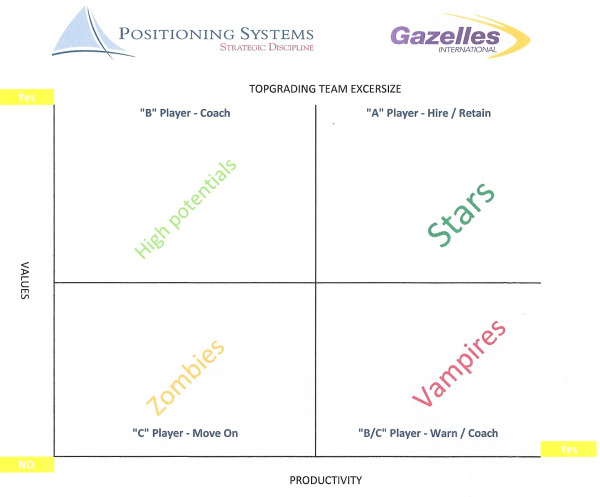 We recommend a performance matrix that measures your teams living the company’s Core Values against their performance. Your leadership team should complete this on each of their staff a minimum once per quarter. The best employees or “A” players tend to be in the right quadrant, high in both living the Core Values and performing at an extremely high level. It’s similar to the GE performance matrix displayed in NFL Draft – Hiring the Right People – One Question. A template example is shown on the right. Recently I discovered a software program (extremely affordable) that monitors both. It’s called Threads and it balances performance and culture giving employees this visual on how they are doing in culture and performance. It’s intended to be reviewed each month, eliminating the need for quarterly, semi-annual or annual reviews. It dovetails nicely with Aubrey Daniels views on the problems with Performance Appraisals. If you’d like to learn more please give me a call, or email me. The beauty of threads is the visual it provides employees. It gives them a clear view of where they are in terms of their performance within the business culture and their performance. 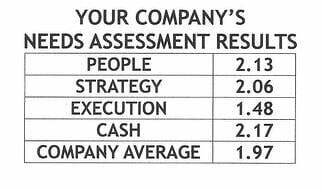 Would such a visual have helped my client keep his valued employee? It’s unclear. Just remember that the biggest reason (82%) your people will leave is due to their manager. Recognition, rewards, relationships help spur performance and build bonds that make it more difficult for your best people to leave. Some will leave due to the opportunity to better themselves. Make sure it’s always the case with your employees by balancing culture and performance. We often tell your Positioning Systems and Gazelles customers that achieving success is 1% Vision and 99% alignment. On Tuesday one of my clients launched their 2nd Trimester theme. We’ll look at what they did and how critical it is to get everyone in the company aligned and aware of your priorities in order to achieve success next blog.